When a group of 15 smiling employees from The Standard rolled up to the Community Cycling Center on a sunny Friday afternoon, I knew we were in for a treat. The Standard participates in a volunteer group every year, while also matching their time with a generous donation to help keep our programs strong. Volunteer groups are comprised of individuals from organizations and businesses that dedicate an afternoon to cleaning up donated bikes for our Holiday Bike Drive. Making sure that the bikes look as shiny and clean as possible is the first step before the bikes are refurbished and ready to be wheeled out the door to children aged 3-8. The afternoon started with a recollection of our very first bikes, which helped get everyone in the mood for helping a new generation of riders get onto their first bikes. This seasoned group of volunteers jumped right in to start cleaning, and were already getting bikes up on stands and spraying them down with Simple Green before Randi, our Volunteer and Outreach Coordinator, could say “Go!”. In just a few short hours, the group had cleaned up a stunning batch of 15 bikes that are now ready to move on to the next set of volunteer hands. All of our Holiday Bike Drive bikes are cleaned and refurbished by the volunteers that commit their time and energy to getting more people in our community onto bikes. 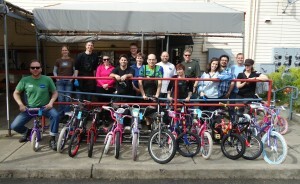 One Standard employee, Kristin, also donated two bikes during her afternoon with us, a volunteer group first! The day ended with a group circle to discuss how the day went, and what we all learned. Many of the volunteers really enjoyed learning more about how to clean up bikes, a skill they can bring home to clean their own bicycles. 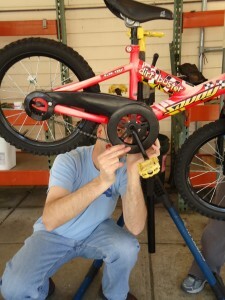 “I love working on the little bikes that will go to kids. I love taking part in that,” said Julie. Being my first time attending a volunteer group, I felt quite a sense of awe at the dedication and enthusiasm in this group, and how wonderful it was of them to give up their Friday afternoon to clean bikes for kids. I will compare all the future volunteer groups to this one, and they have some big shoes to fill!